One of the simplest way to quilt a quilt is with straight lines. The walking foot is a great tool for quilting row after row of straight lines. From stitching in the ditch (SID) to beautiful grids, the humble line can take on different looks. One of the keys to quilting is the spacing or density of the quilting motifs. Small dense designs can bring a completely different texture to the quilt than a large light density design. Evenly spaced designs feel more formal and elegant than randomly spaced designs which feel more whimsical and relaxed. You have my permission to play around with any of the designs I share with you in the 31 Day series. Don’t forget to try randomized spacing for a completely different look. 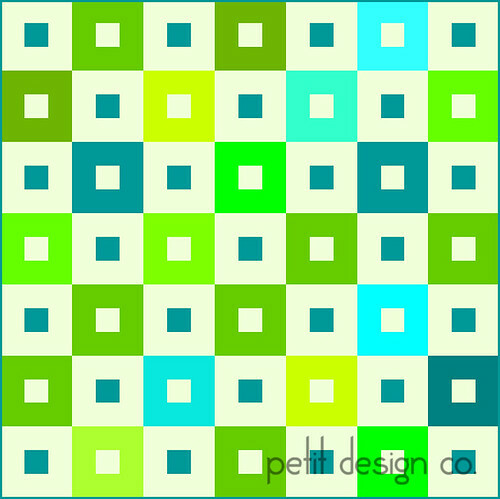 I went ahead and created this simple quilt in EQ6. I will be using it through out the 31 Day series to show you how different a quilt can look depending on the quilt designs chosen. I came up with 6 easy straight line designs, but there are so many other ways that you can combine straight lines that the possibilities are endless. I didn’t really cover grids, we’ll talk about those another day. - A. SID – stich in the ditch:Stitching in the ditch refers to stitching along the block lines formed by seams. When done properly SID is not visible. The threads hide right in the shadow of the seams. Some quilters actually pull on their quilt top as they are sewing exposing the seam line and stitching right on the seam line. I take a different approach so that I don’t stretch or distort my quilt top. You know how you end up with a bump or drop after pressing your seams to one side? If you run your fingers along your quilt top you will see what I mean, depending on what direction you are headed you will either hit a bump or a drop at each seam. I make it a point to SID a hair width away from the “drop” side, right before you are about to go over the bump. The “bump” side tends to almost magically shift over and cover the threads, especially once the quilt is laundered. SID is usually where most new quilters start. It’s a relatively safe design that won’t detract from a quilt top. It’s simple and elegant. It allows the design and fabrics to do all the talking. B. ColumnsThis design looks great on most any quilt. It doesn’t matter if the columns are 1” apart or 4” apart. Keep in mind that quilting 1” wide columns on a queen size quilt is going to get old pretty quickly! Try this design in rows going horizontal. C. Corner StoneThis design is achieved by quilting a line on each side of the block seam line. Allowing the stitching lines to cross where blocks meet creates a small square. This is a very simple design that looks great on most any quilt and looks a little more complicated than SID. However I find it much easier to accomplish because you don’t have to worry about the seams being in your way. D. Randomly Spaced ColumnsYou can achieve a more whimsical look to a quilt if you randomly space the quilting lines. E. L’sTry quilting an “L” by following sides of your block and then echoing it over and over until you fill the block. Don’t for get that you can play around with line spacing. F. PlaidThis design is so fun and laid back. 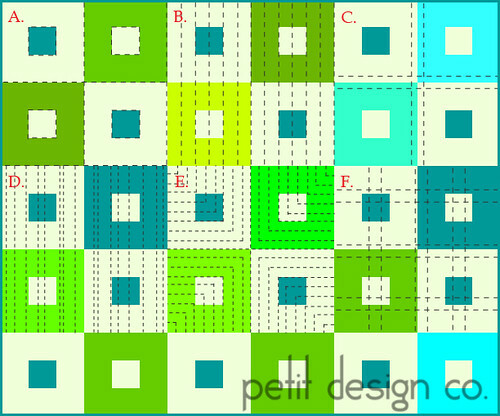 For a more whimsical approach try random groups of 3’s and 2’s on throughout your quilt. This design will look more relaxed if you avoid spacing your lines down the middle of your blocks. Feel free to add pictures to the Petit Design Co. Flickr group if you try out any of these designs. Tomorrow I’ll show you the “L” design and talk about starting, stopping, and turning corners. These are great suggestions. I love the humble line for quilting. I've done some meandering quilting and some line quilting. I live both, but I think the lines allow the colors, fabrics and blocks star. I look forward to trying the randomly spaced columns when I quilt my next top, a scrappy 2 1/2" strip purple sampler. Thank you for the tips. I am enjoying your posts in this 31 days of quilting with a walking foot series. I read this with a lot of interest. I am just finishing up a top and I know I want to some kind of straight line quilting, I'm just not sure what yet. Thanks for the ideas. I will link it up when it's done. I only do straight line quilting right now so I'm anxious to see all of the ideas. Right now I usually channel quilt about 2" apart or grid diagonally. I like the look of the plaid. It is great of you to be taking the time to do this for us. I'm working on several tops at the moment and will definetly be taking some of your ideas out for a road test. That's cool to see in your diagram! Thanks for taking the time to teach us! Thank you so much for this tute! Very helpful. Thanks for the visual,it is very helpful to see what you are talking about :) Will be trying out some of these soon. Thank you so much for posting your designs. I love all the choices, but have a question. I'm working on a zig zag pattern right now and when it comes to the pivot point I have problems. I have tried to back stitch 1 stitch, just so it will anchor the pivot, but sometimes it still pulls the stitch. It looks like it rounds it, the back thread pulls up just a little. Have you had this issue and how to I fix it. Thanks again for your blog, Enjoying following you. Thanks so much for the humble line...I just tried some line stitching on my daughters tablerunner and it looks awesome....thanks again.